This figure illustrates Mars Pathfinder's position over the current two weeks. The view shown looks down on the ecliptic plane from the ecliptic north pole. The Sun is at the center of the plot. The orbits of Earth and Mars are the inner and outer circles on the plot; Mars Pathfinder is now on the surface of Mars, so it moves along with the planet in its orbit. The first tics labeled "Earth" and "Mars" at the top on the orbits are the positions of the planets at launch (12/4/96); the second tics along the planets' orbits are their positions at arrival (7/4/97). The remaining tics on the planet orbits are the positions of each planet over the current two weeks. This figure illustrates Mars Pathfinder's position during its mission on the surface of Mars. The view shown looks down on the ecliptic plane from the ecliptic north pole. The Sun is at the center of the plot. The orbits of Earth and Mars are the inner and outer circles on the plot. Mars Pathfinder moves along with Mars in its orbit. The tics labeled "Earth" and "Mars" along the orbits are the positions of the planets at the beginning of each month from July 1997 to August 1998. The two "Earth" labels very close together at the lower right of the Earth's orbit are its position on July 4, 1997 and its position on July 1998. (Of course, the Earth comes back to the same position in its orbit after 1 year!) The next label, which should appear thicker, is actually 2 labels for Earth on August 1, 1997 and August 1, 1998. The rest of the labels follow on the first of each month from September 1997 to June 1998. The "Mars" labels start at the lower left in July 1997 and continue around to the upper left in August 1998. Since Mars' year is 687 days long, it does not complete one revolution around the Sun in the Earth year from July 1997 to July 1998. This figure illustrates Pathfinder's position over its entire cruise to Mars. The view shown looks down on the ecliptic plane from the ecliptic north pole. The Sun is at the center of the plot. The orbits of Earth and Mars are the inner and outer circles on the plot; the Mars Pathfinder interplanetary trajectory is the arc running between these two orbits. The first tics labeled "Earth" and "Mars" at the top on the orbits are the positions of the planets at launch (12/4/96); the last tics along the planets' orbits are their positions at arrival (7/4/97). The intermediate tic marks on the planets' orbits and the tic marks on the spacecraft trajectory are their positions on the first of each month from January to July, 1997. 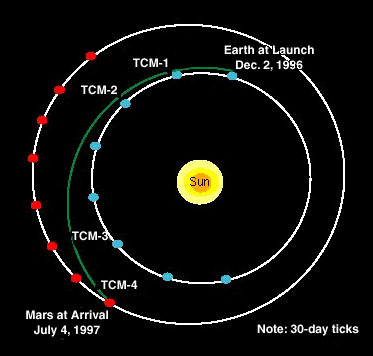 This figure illustrates Pathfinder's position at the times of the 4 Trajectory Correction Maneuvers (TCMs) - January 10, February 3, May 7, and June 24, 1997. The view shown looks down on the ecliptic plane from the ecliptic north pole. The Sun is at the center of the plot. The orbits of Earth and Mars are the inner and outer circles on the plot; the Mars Pathfinder interplanetary trajectory is the arc running between these two orbits. The first tics labeled "Earth" and "Mars" at the top on the orbits are the positions of the planets at launch (12/4/96); the last tics along the planets' orbits are their positions at arrival (7/4/97). The intermediate tic marks on the planets' orbits and the tic marks on the spacecraft trajectory are their positions at the times of each TCM. The tic marks on the spacecraft trajectories at the point where they begin to diverge from each other are their positions at the time of closest approach on 3/15/97. On March 15, 1997 00:56 UTC (March 14, 1997 about 5 PM PST), Pathfinder and MGS made their closest approach on their way to Mars. At that time, the two spacecraft were separated by 4.7 million km or 2.9 million mi. Pathfinder will now continue to get closer to Mars than MGS, preparing for arrival on July 4, 1997. MGS will follow a longer orbit and arrive at Mars in September of 1997. To those of you who have recently sent questions via e-mail, I am working on responses. It may take me a while due to the large volume of e-mail I've received since our landing on July 4th. Please be patient since I do intend to reply to all of your messages eventually. But if you get tired of waiting, check out Mars Team Answers Your Questions and see if you can find your question there.